It is 18K rose gold, 41mm size case, brown color dial, exhibition glass back, automatic movement, and features the date, with chronograph function. This timepiece has a 22K rose gold rotor which is etched with the Ulysse Nardin name and anchor logo, and is visible through the exhibition glass back. 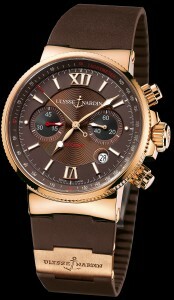 Shown on a sporty and elegant brown rubber strap with rose gold folding buckle. View other Ulysse Nardin models. CALL US 956.687.2981.